Bari Life bariatric vitamins and bariatric supplements, in particular the multivitamin formulas, were designed specifically to improve patient adherence to the recommended guidelines for adequate prevention of deficiencies after bariatric surgery. Most bariatric coordinators and dietitians will tell you that their number one concern for patients’ long-term success with maintaining appropriate levels of vitamins and minerals is helping them find a solution for taking their supplements regularly as directed. Dr. Stephen Boyce, Creator of Bari Life Bariatric Supplements, determined from his clinical experience that two of the most common reasons patients were not adhering to the recommendations were due to a complicated regimen and the expense of the supplements. Additionally, one of the predictors is “patients’ lack of belief in benefits of treatment.” The internet is full of misinformation about vitamin and mineral supplementation after bariatric surgery. The truth is that vitamin deficiencies are real and can cause serious medical conditions and the bariatric surgery community is at higher risk than the general population. That is why at Bari Life we are committed to following the latest ASMBS recommendations and offering well tolerated, convenient and affordable multivitamin products to help patients find the best way for them to be adherent to their physician’s recommendations. 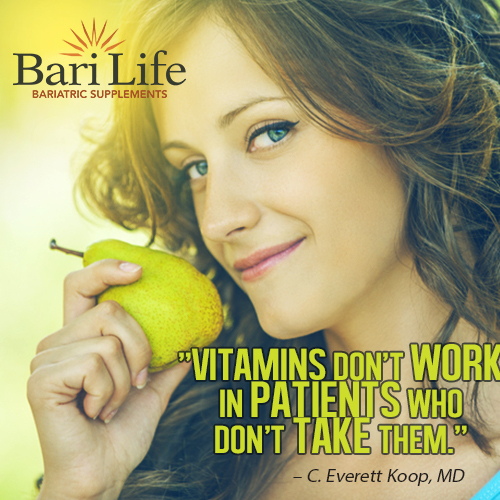 Try Bari Life multivitamins today and simplify your bariatric vitamin and mineral regimen.